CRY – Child Rights and You is an Indian NGO, founded in 1979 with the dream that no Indian child would be deprived of basic rights like survival, participation, protection and development. Over three decades of working with and for children and their families across 23 states in India, we have learnt that permanent change is possible only when we tackle the root causes that continue to keep children uneducated, exploited and vulnerable. 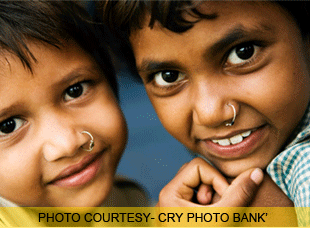 With the support of concerned Indians, CRY has changed the lives of more than 2,000,000 children by supporting over 200 grassroots from villages and slums across India. Partnering NGOs and communities, CRY has conclusively proven that sustainable change is possible when communities have the information and the motivation to come together to ensure lasting change in the lives of children. CRY’s role is that of an enabler between two groups of people – the development organizations working for child rights at the grassroots level and people like you, who come together for child rights. We've learned that the only sustainable way to make change last is to adopt what we call the 'child rights approach.' First by looking at children’s issues in their entirety, rather than through the silos of education, health, child labour, child abuse, feticide/infanticide and so on. We mobilize each local community to find long-term solutions to these problems and ensuring relevant laws and policies that guarantee implementation of their rights. 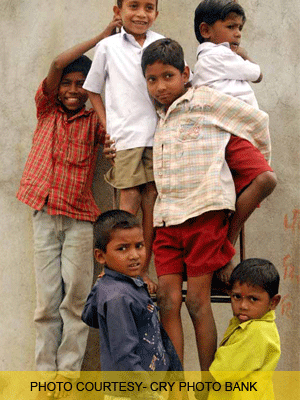 Your Cashback will help us continue to fight for the rights of these children and bring about the much needed change! Deepak belongs to the Scheduled Caste community of the Aghara village and is the eldest among the 4 children in the family with 1 brother and 2 sisters younger to him, his father is a daily wage earner and his mother a housewife. The financial crisis in the family compelled Deepak to migrate to Kanayakumari in Tamil Nadu to work in the brick kiln as daily wage earner. He used to work for 14-16 hours a day and took rest in a small makeshift room made up of baked bricks piled up in form of walls on all the 04 sides. He used to cook & eat rice potato along with his uncle who had accompanied him to Kanayakumari. Meanwhile, Samagra Seva in association with CRY- Kolkata had initiated the project of ensuring child rights through community intervention in the 28 villages of Jamui district. The organization had formed child protection committees in all the Mahadalit and Dalit hamlets of the intervention villages. Despite several attempts made by the parents and Samagra Seva volunteer, he could not redirect his focus towards studies. But, as destined, Deepak happened to interact with a few girls who were middle school dropped-out from the same hamlet and earlier use to work in nearby brick kiln. The girls were hurrying to RBC (Residential Bridge Course) center for their classes under the education initiative of government of Bihar at Aghara village for the classes during the weekend. This moment was captured and often used an opportunity by the parent and project team to motivate Deepak again and which clicked. After this, he not only attends school regularly but also actively participates in the other extra co curriculum activities of the school and win prizes. He is currently studying in class 8. For more information, please visit www.cry.org.